Workers’ compensation is a form of insurance that employers must have in case one of their employees is injured while working. While workers may not sue their employer for an accident in Civil Court, workers may open a claim for workers’ compensation benefits with the Massachusetts Department of Industrial Accidents. Filing for workers’ compensation can be a complicated process. To ensure that fair compensation is received through workers’ compensation, an injured worker should speak with a reputed the Massachusetts personal injury lawyer to obtain more information about filing a successful claim. In Massachusetts, every employer must carry workers’ compensation coverage. To know if the company you work for has workers’ compensation coverage, you can call Massachusetts Department of Industrial Accidents. It is well worth your effort to have this information, should you need it in the future. Medical Expenses: This should include all doctor’s visits, therapy fees, medical tests, medication and surgeries needed following a workplace accident. Under workers’ compensation rules you may have to visit an insurance carrier authorized doctor. Temporary Total Disability: This is when a doctor says that you are completely unable to work because of your injury. 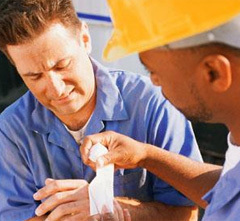 The amount you can receive for time away from work depends on the severity of the injury. In most cases, you may receive 60% of your regular wages during your recovery for a maximum of 3 years. Permanent Total Disability Benefits: When a catastrophic injury occurs and the victim suffers a permanent disability, total and permanent disability benefits may be available. Death Benefits: When someone is killed while working, the victim’s family may pursue death benefits. Families may seek funeral expenses up to a certain amount, compensation to dependants and additional benefits as well pertaining to administration of the estate. Massachusetts workers may also be able to file a third-party claim to receive additional compensation. For example, when someone is injured using a defective product at work, the victim may file for workers’ compensation benefits from the employer and a third-party claim against the manufacturer of the defective product. A third-party claim may be needed to receive fair compensation for a serious injury. Many workers’ compensation claims are routinely denied because they do not have all the required information. Injured workers would be well-advised to seek the help of an experienced workers’ compensation attorney before filing for benefits. In cases where a claim has been denied, a skilled attorney may help the injured victim obtain benefits through the judicial process. Teresa Benoit helps injured victims pursue compensation claims for their injuries and losses. At Benoit Law we understand the financial burdens of a workplace injury and have helped numerous Massachusetts workers and their families obtain fair and full compensation under the law. Call us today to schedule your free and comprehensive consultation.